Remember how I told you all that I have a bad case of Fall envy? Well, it's still going strong. I'm crafting, decorating and baking all things Fall-themed in an attempt to make myself believe it will be Fall like here soon. 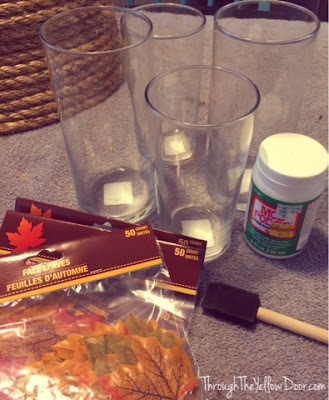 The tricky part is doing all these things in a budget friendly way, which means I need to rely on finds from Dollar Stores and working my crafty magic. 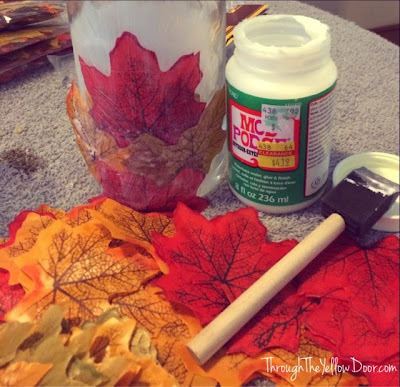 I whipped up some Fall leaf "candles" using items exclusively from the Dollar Store (the Mod Podge I already had at home, of course) to include in our Fall-themed entryway display. I LOVE how they turned out! 1.) 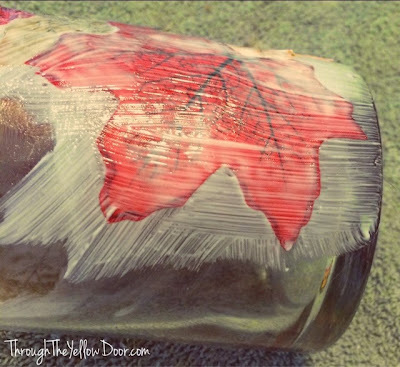 Using Mod Podge (ideally not the outdoor formula - it's all I had in the house, so it had to do) apply the fabric leaves onto the glass, one by one. 2.) Continue around the entire exterior of the glass, making sure the entire surface is covered. 3.) 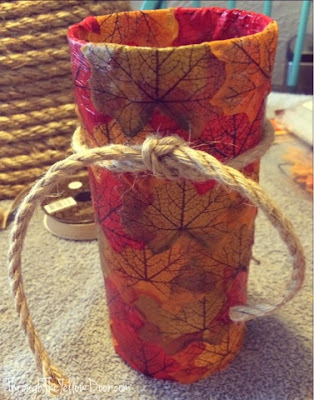 Once you're happy with the leaf exterior, cut some rustic ribbon/twine and tie it around each candle. 4.) 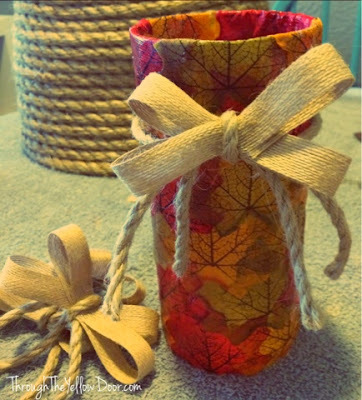 Next, create a cute "burlap" bow and secure it to the glass with your rustic ribbon/twine. 5.) 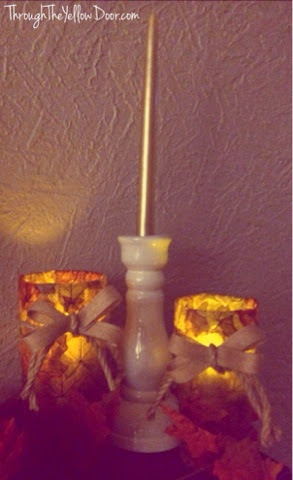 Let the glass(es) dry completely and then place your battery operated "candle" inside to finish off the candle. 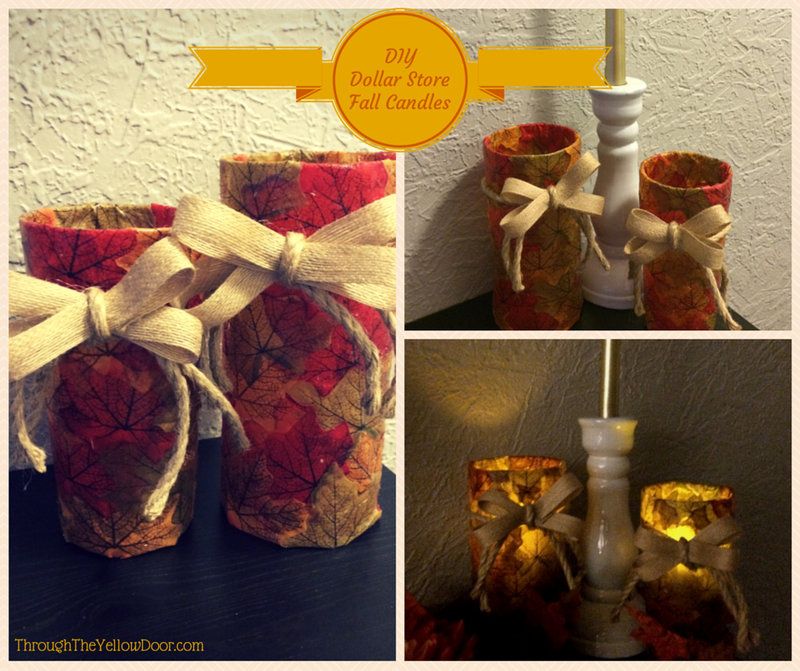 BAM - adorable, DIY leaf "candles" to incorporate into your Fall decorating. When you turn off the lights and let the "flames" flicker through the decoupaged leaves, there is a fun stain glass effect. So fun! I'm finishing up the last touches to our entry-way tablescape and I'll share that as soon as it's ready! Update: finished the (frugal) Fall entryway display and I'm obsessed! It looks so good! 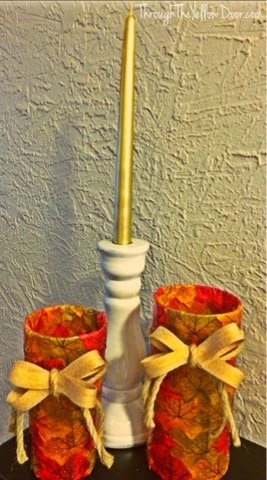 This is such a cool craft! I thinks the bows are a really cute touch! What a cute idea. Those are great. Love the way the candle light shines through. I have some similar leaves I purchased at the Dollar Tree. I think I'll give this project a try.